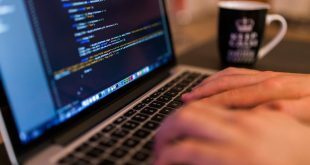 For any computer user, one of the most performed action is copying and pasting text, images, and other content. 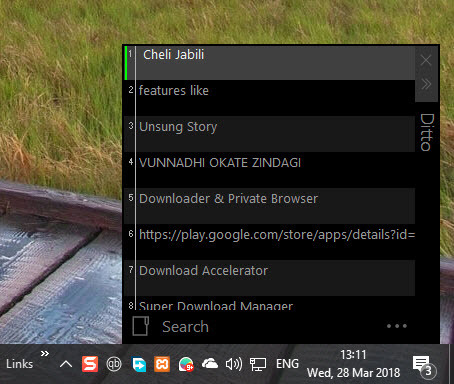 Though the default Windows clipboard does the job pretty nicely, it is nowhere near adequate for power users or even for a moderate user who deals with a lot of content. For instance, once you copy something in Windows, you can no longer access the content that you copied earlier. Its just lost in the ether. Earlier this week we talked about the best clipboard manager for Android and macOS. And some of you asked for the Windows version. So, if you are looking to improve the clipboard efficiency on Windows and in turn increase your productivity then here are some of the best clipboard managers for Windows. Ditto is a free, lightweight, and open-source clipboard manager that is filled with many useful features and is highly configurable. All the items you copy are neatly arranged in rows. To access the stored clipboard items, simply double-click on an item and it will be copied to the clipboard so that you can use it as needed. The best thing about Ditto is that you can configure how many clips can Ditto store when the entries will expire, customizable keyboard shortcuts to access different options of Ditto, etc. What’s more, you can create Groups and manage clipped items accordingly. Similar to Ditto, 1clipboard is also free and saves everything from copied pictures to text. You can search your past clipboard items and copy any of them. 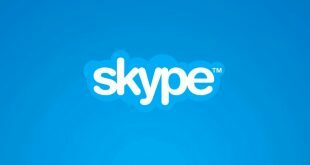 But what separates 1clipboard from the rest is the ability syncs across Mac & Windows devices, though these features require internet access. The only issue with 1clipboard is, it’s still in the early beta stage, so you might find it unstable sometimes. Although it our testing, it worked fine. Overall if you are looking for a free clipboard manager that sync between Mac and Windows, 1clipboard is for you. ClipClip is yet another good clipboard manager that is lightweight and completely free. What differentiates ClipClip from Ditto is its traditional design and the ability to edit and modify clips as needed. It just looks like any other Windows application. All your clips appear right in the main window. When you want to use the clip, simply right-click on it and select the Use Clip option. To edit a clip, double-click on it and modify the clip as needed. Some of the best features of ClipClip include but not limited to the ability to change clip type, ability to save clips in text format, custom groups, built-in translator to translate clips between different languages, customizable hotkeys, etc. As good as the application is, as of writing this, it is in public beta stage. So, expect some bugs, though I haven’t experienced any in my usage. Clipboard Master is much more than a simple clipboard manager. Apart from giving you sufficient options to better manage all your clips, it can also act as a quick screenshot tool, password safe, and flexikeys. In case you are wondering, flexikeys feature can intelligently auto-complete directory names and pre-defined text templates, much like a text expander application. Just the like above clipboard managers, Clipboard Master allows you to manage your clips in different groups. Other than that, Clipboard Master has all the required options like customizable keyboard shortcuts, quick paste, support for global context menu, powerful search and filtering feature, clip format converter, a quick preview for images, etc. As good as it is, the user interface of Clipboard Master is not the best and as a result, there is a good amount of learning curve to get used to Clipboard Master. 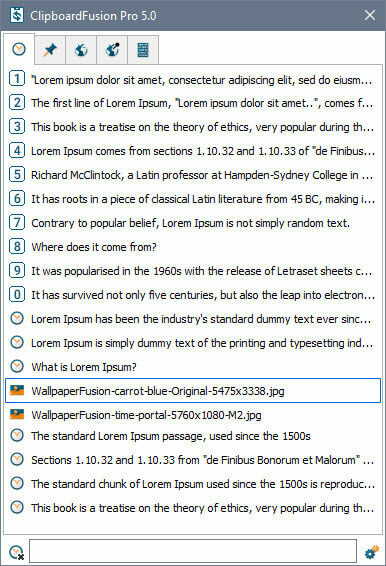 ClipboardFusion is one of the most advanced clipboard managers for Windows. Along with the regular clipboard manager features like support for text formatting, support for multiple file formats, ability to edit clips, previews, etc., it also has some of the best features like the ability to create custom macros and triggers. The macros and triggers give you a nuanced control and you can do almost anything you want with ClipboardFusion. Add to that, the user interface of ClipboardFusion is traditional and there is no learning curve unless you want to make use of the macros feature. Macros are created using c# language. Moreover, ClipabordFusion is also available on other platforms like Android, iOS, macOS, Linux, Chrome browser, etc. If you want to, you can sync your clips between devices using the Sync feature. All in all, if you are looking for a powerful and cross-platform clipboard manager that lets you create your own functions using macros and triggers then try ClipboardFusion. Price: The app is available in both free and paid variants. The paid version costs $15 per user and gives you access to additional apps and features like advanced triggers, advanced macro options, etc. You can get more details from here. 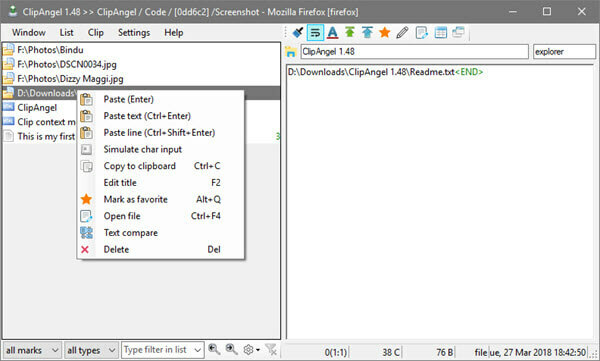 ClipAngel is a small, portable, and open-source clipboard manager for Windows. However, don’t take its small size for lack features. 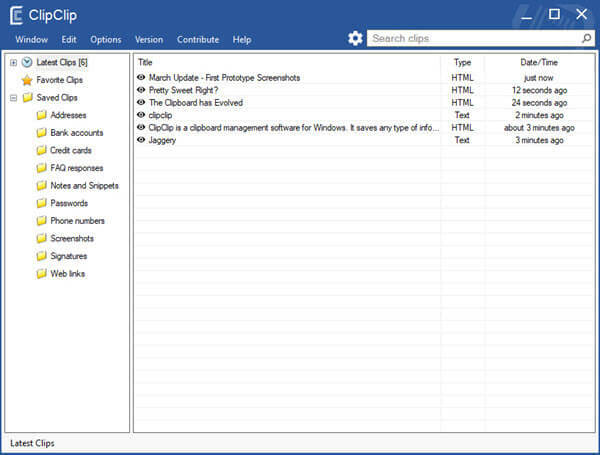 It has all the basic features you will need of a good clipboard manager. The best thing about ClipAngle is its beginner-friendly user interface and how easy it is to use and manage the clips. Features of ClipAngle include support for multiple file formats, filters, support for hyperlinks, custom hotkeys, focus list, ability to join clips and mark favorites, ability to configure the app to ignore certain applications, etc. If you are looking for a portable, lightweight, and open-source clipboard manager that has all the basic features then give ClipAngle a try and see how it works for you. ClipMate is yet another powerful clipboard manager that has a lot of interesting features, same as ClipboardFusion. For instance, you can create your own macros. If need be, you can even encrypt your clips so that only you can access the data. Since you can create custom groups, you can manage clips accordingly. Unlike in other apps, when you delete a clip from ClipMate, it is moved to its own Trash Can rather than deleting it completely. This feature is very useful when you accidentally delete a clip. 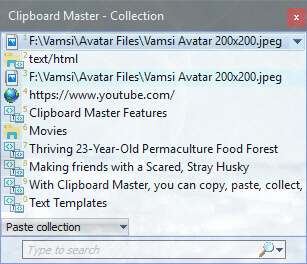 Of course, ClipMate also has a powerful search feature that lets you find the clip you are looking for using various filters like captured after, has format, has text, creator, URL, member of collection, etc. Features of ClipMate include groups, profiles, edit clips, combine clips, convert clips, export and import clips in XML format, etc. As good and powerful as it is, the user interface is straight from the 90s. It can take some time to get used to it. Other than that, if you are looking for a powerful clipboard manager and don’t mind dated user interface then you should give ClipMate a try. Price: ClipMate is a paid application and you can get it for $34.95. There is a free 35-day trial if you want to test drive the app. 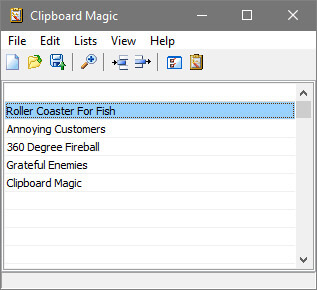 Clipboard Magic is a lightweight and basic clipboard manager and extender for Windows. Unlike other clipboard managers, there are no fancy options or confusing settings. It just captures all the text clips and lists them accordingly. 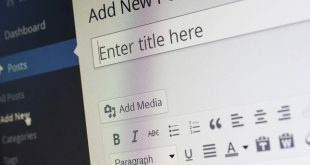 When you want to make use of a clip, select it and press the assigned keyboard shortcut or select “Edit > Copy clip.” Unfortunately, Clipboard Magic has no support for rich text, image, or other formats. As I said before, it is a very basic application. However, it does let you edit clips, load clips, and save clips when needed. So, if you are looking for a simple app to keep track of all your clipboard clipping and don’t mind lack of features then Clipboard Magic is for you. 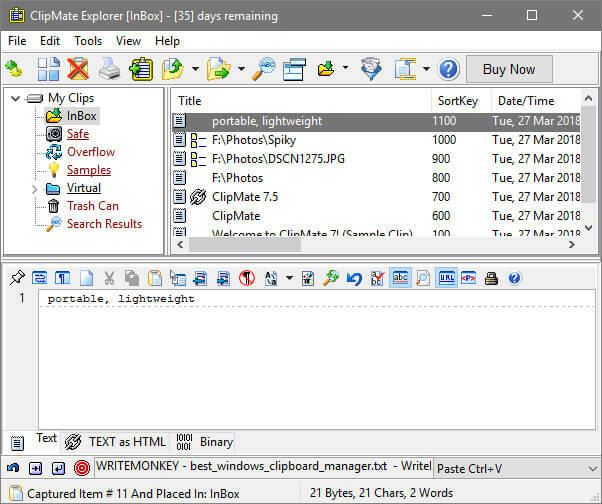 We saw some of the best clipboard manager tools for Windows. If you are looking for freeware that just works, Ditto is a good option. If you need a clipboard manager that sync between your Mac and Windows PC, 1Clipboard should work. Or for more sync options i.e. 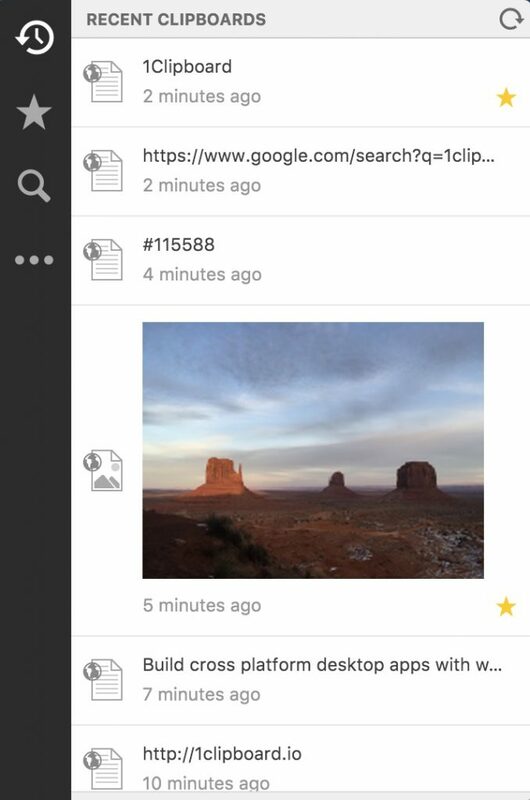 Android and iOS, try Clipboard fusion. Though that comes with a price tag of $15 per user. Finally, if you are someone who likes to install one app that does everything, that Clipboard master is a better choice. The free version comes with screenshot capture and text expander option along with clipboard manager. But on the flip side, it doesn’t have the best UI out there. That’s it for now. Comment below sharing your thoughts and experiences about using the above apps to better manage your clipboard in Windows.